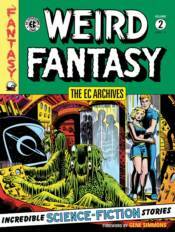 The fantasies just get weirder at Dark Horse! This wonderful and bizarre volume collects issues #7-#12 of the groundbreaking comics anthology-remastered in glorious digital color! Featuring twenty-four breathtaking tales from iconic writers and artists including Al Feldstein, Jack Kamen, George Roussos, Wally Wood, Joe Orlando, and Max Elkan.